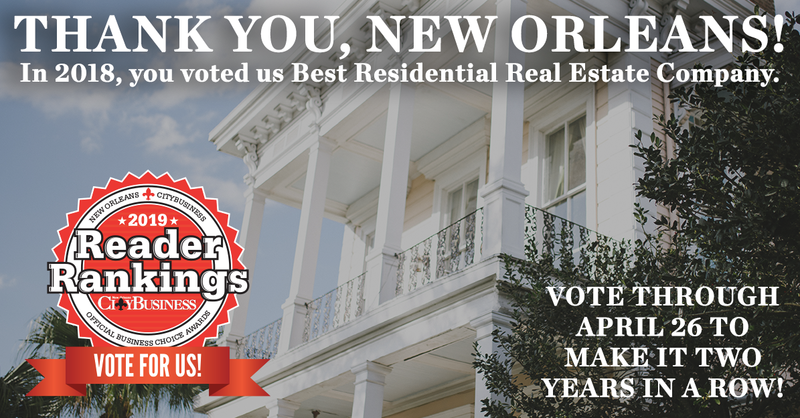 We’re honored that you, the locals of New Orleans, voted Gardner Realtors the “Best Residential Real Estate Company in Metro New Orleans for 2018”. We could never thank you enough for the 75+ years you have trusted us with your home buying and selling needs, but we would like to share some of the many business values that make us the successful New Orleans based company we are today. Gertrude put innovation in our company’s DNA from day one. 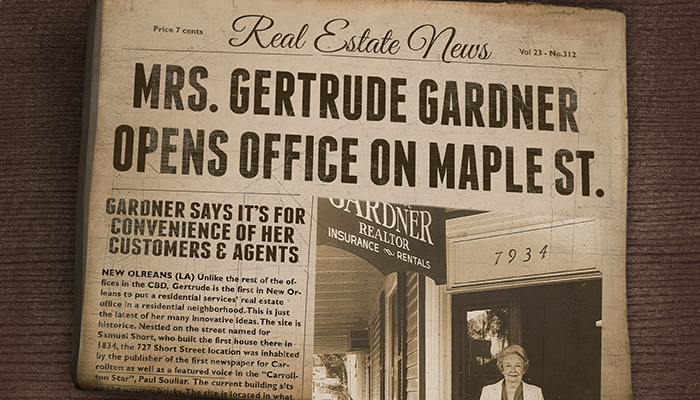 While other residential real estate offices were typically located in the Central Business District, Gertrude was the first to open one in a residential neighborhood. She simply thought it was more convenient for her clients! 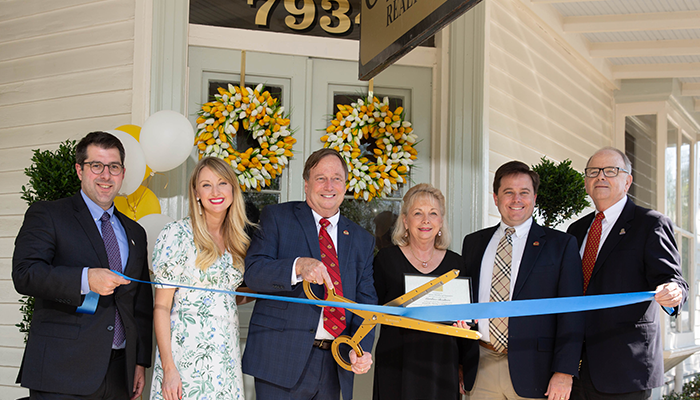 This was just one of her many innovative ideas that would be celebrated… and celebrate her we did at the restoration and rebuilding of Gertrude’s first residential neighborhood office at 7934 Maple Street. While we enjoyed flipping through old black and white photos and reading old newspaper clippings, we also took our 75th year to celebrate the path we’re currently on and the exciting road to where we’re going. This is a good time to acknowledge that whether in 1943 or 2019, none of this would be possible without you, the locals of New Orleans. We want to take the time to say, THANK YOU. You’ve allowed us to live out our passion for helping you create the life you love through real estate! 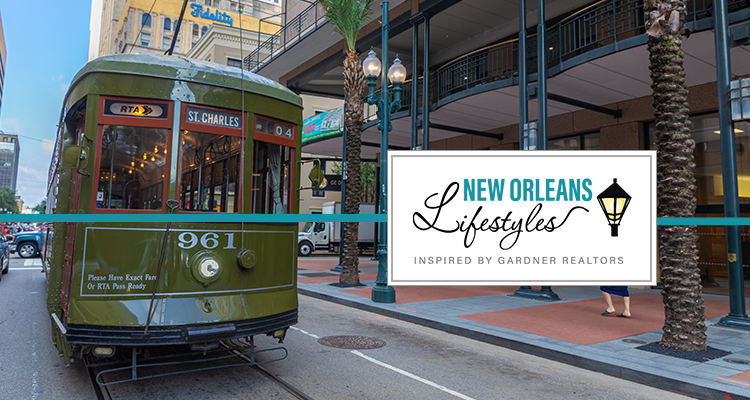 We’re honored that you, the locals, voted Gardner Realtors #1 Residential Real Estate company in the New Orleans Metro Area for 2018. Over these 75+ years and four generations of family leadership, we’ve learned a lot. We couldn’t repay you for helping us achieve our success, but we would like to give back as best we can… First, we promise to keep the same passion and mission for the next 75 years. Second, we’d like to share a couple of business tips passed on from one generation to another, many of whom I am proud to call my family. It takes a village to raise up a company like ours, and we believe that high tides raise all ships. This is especially true in the most unique city, New Orleans. We embrace innovation here; however, with respect to tradition and family values, we tend to do it a little different… and in my opinion, better! So, we hope you’ll put these tips into practice, and create an even stronger business community here in the Crescent City. “I simply can’t take credit for successes. Our team can. You see, without my dedicated team, we would not be able to create the happy home buying and selling experiences we’re known for. I’m thankful for every person, both out in the neighborhoods and behind the scenes. For us, we realized that we exist for a greater reason than helping people buy/sell homes. We exist to help you create the life you love.™ This means we take time to understand The Life List (much like a “Bucket List”) of our buyers, sellers, Realtors and employees to make sure we are showing a path to accomplishing these dreams. Now, that’s a great reason to wake up every day and go to work! *Side Note: Having Mission, Vision, Value Statements is good. However, if you have these, make sure it’s not the same ol’ verbiage people hear everywhere over and over. Make sure it’s relatable and shows the heart of your company. Our dad, Glenn Gardner, has always taught us people don’t care how much you know until they know that you care. Many bosses care, but they don’t know how to show it. So, avoid starting conversations talking about yourself, and instead ask about his/her family, occupation, recreation or dreams. When you do this, you learn about who people are both personally and professionally. With a deeper understanding of the individuals on your team, you are able to identify pleasure points or solve pain points in their life that are unique to them. You are also able to provide the most personalized team member rewards for doing a great job! Many of our leaders start their day by writing personal notes to two people who positively impact their life. It can be to say Thank You, Congratulations, or Just Thinking About You. This same principle applies to innovation. Having the best technology tools is absolutely necessary when it comes to running a business today. However, always remember that great relationships and customer service can never be replaced, not even by the newest and fanciest app or website. Remember to pick up the phone and talk, meet clients for coffee, and strengthen those relationships through frequent LIVE interactions. If people know the meaningful reason (not just increase profitability) behind the initiative or new way of doing business, they are more likely to feel invested in it, bringing it to life in a greater way. Your team needs to understand the vision of what we will accomplish once we take this step forward. Furthermore, they need to understand how this step forward is in line with our reason for existence. As a leader, you are not the only one with good ideas. Once your team understands the “why”, start by having your team contribute many ideas. We call this the “Creative Meeting” where all ideas are welcome. Then together, narrow down the best ideas that accomplish the guiding objective you set out for. Once you have chosen the best idea that accomplishes the objective, you can set your “Business Planning Meeting”. This meeting goes into the nitty gritty of HOW. After implementation, always make time to debrief. Why? Hindsight is 20/20! But, if you skip the opportunity to debrief, you are missing out on the opportunity to do it even better next time. Also, on the note of Candid Culture, make sure you ask your team often how you can better support them in being successful in their roles. What can you, as their “boss”, improve upon? Having this ongoing dialogue promotes healthy communication and opens up the opportunity to not only give feedback but also receive it. *** Side Note: The Top Workplace Survey of employees throughout Metro New Orleans revealed that it’s not the pizza parties, casual Fridays or even salary/benefits that influences engagement most… But rather their BOSS! So, in order to attract a talented team, make sure you’re not just working on your business skills but also your management skills. We have never met anyone who is strong in all areas. Whether you fall into the Power, Perfection, Peace or Party category, We find that the strongest people are the ones who are aware of their own strengths as well as weaknesses. Since these individuals are confident enough to accept their weaknesses, they can identify people who can assist them in those areas… making them collectively stronger. So, if you don’t have the knowledge or skills in a particular area, find someone you respect who does! You’ll find that knowing you can lean on people you trust creates collaborative energy that results in motivation to do the unstoppable! The success of a well-balanced team is unmatched. Provide the opportunity to give both time and resources to a specific cause. Ideally, this cause would be close to the heart of your industry. For us, when you buy or sell a home with a Gardner Realtor, you are helping the homeless find hope and a new start through our support of the New Orleans Mission. We provide our team with the opportunity to donate out of their paychecks and/or give time monthly by serving dinner or providing encouragement to women through the work program we created called Lovely Creations. Here’s to creating a stronger, healthier business community in New Orleans TOGETHER!